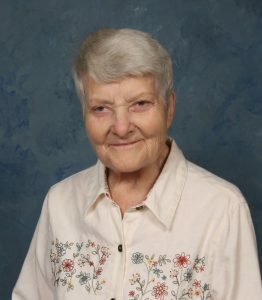 Sister Kathleen Hannan (Sister Mary Cabrini) has had several careers in her 70 years as a Grey Nun of the Sacred Heart. A gifted musician, she taught music in elementary schools and at Sacred Heart Junior College, a school for the education of Grey Nun novices. Her change in career came with the completion of a Master in Social Work degree. Beginning in the early 70’s, she ministered as a social worker and counselor in various sites in the Philadelphia area and in upstate New York. One of her ministries was as Director of Social Services at St. Joseph’s Home in Ogdensburg, New York. In her retirement, she lives with her sister Grey Nuns of the Sacred Heart at Holy Redeemer Lafayette in Philadelphia. Sister Kathleen helped me through a difficult time in my life and I will be forever grateful. Bless you. God bless you Sister Mary Cabrini. I still remember our vocal warm up in the BSS choir and think of you whenever I hear the many songs and hymns you taught us. Your teaching has lasted me a lifetime. Thank you from the bottom of my heart.